Homemade jams and preserves have become very fashionable, and can make great gifts for friends and family. They are particularly good for using up ripe fruit and can be stored for several months. This particular recipe is a favourite of ours, and can be stored for 6 – 12 months in sterilised jars. This is an extremely easy jam to make, especially as it does not require a sugar thermometer. 1kg (2 lbs) Bramley apples, cored, peeled and roughly chopped. 1kg (2 lbs) Pears, cored, peeled and roughly chopped. 1kg (2 lbs) Plums, halved. Place all the fruit in a large pan with just enough water to cover the base. Bash the fresh ginger and tie in a muslin cloth and add to the fruit, alternatively you can use 2 teaspoons of dried ginger. 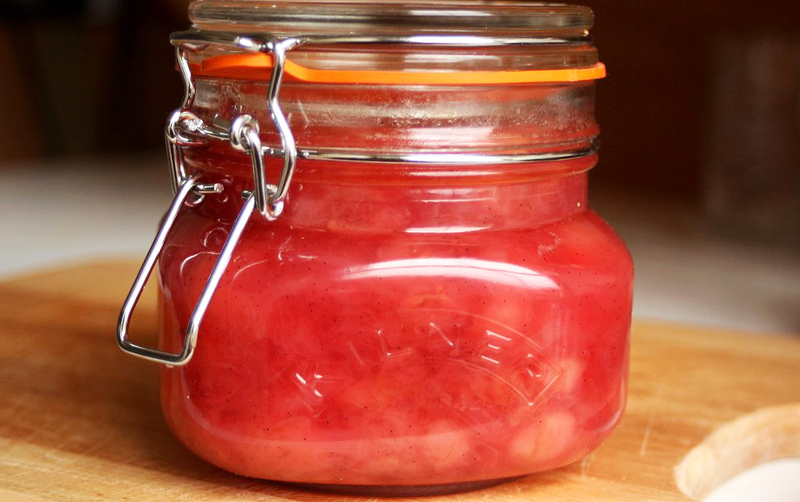 The ginger adds a warm spice to the jam without overpowering the fruity flavours. Bring the mixture to the boil and reduce the heat and simmer for around 45 minutes until the fruit is tender. Remove the fruit mix from the heat and stir in the sugar until it has all dissolved. Add the zest and juice of a lemon and return the pot to the heat. Bring to the boil and cook rapidly for around 15 minutes. You can remove the muslin wrapped ginger at this stage. Remove any scum from the top of the jam mix with a spoon. Remove the pot from the heat. At this point you should test whether the jam is at setting point. To do this, take a teaspoon of the jam (be careful though as this is pipping hot) and pour it onto a saucer. Transfer this saucer to the fridge for 5 minutes. If the jam is at setting point, this tester jam will have become jelly like and wrinkled in the fridge. If the jam does not have this appearance, return the pot to the heat for a few more minutes and repeat. When the jam is ready, pour the hot jam into cooled, sterilised jars, ensuring to fill right to the top and sealing with waxed paper. Make sure the waxed side faces down. Cover the jar with a cellophane cover and secure with an elastic band. Allow to cool. Once cooled, your jam is now ready to use. Lovely on homemade wheaten bread or fruit scones. If you’re feeling adventurous, try a dollop at the bottom of a creme brûlée. Add a spoonful to a red wine reduction and serve with crispy duck breasts. What is your favourite flavour of jam? Let us know by commenting below or connecting with us on Facebook and Twitter.